The Trump administration has been facing intense backlash over its “” immigration policy, which has families seeking asylum being separated at the border. Under the cruel policy, migrant children are being ripped away from their parents and housed in detention centers with “prison-like” conditions. Many reporters, activists, and civilians have been outraged — and so Monday’s White House press briefing had a guest at the podium: Secretary of Homeland Security Kirstjen Nielsen, who was on hand to talk about the Trump administration’s policy. But instead of giving concrete answers, offering feasible solutions, or expressing concern for the affected families, Nielsen defended the administration, blamed Democrats, and . Here, eight of the most infuriating moments from the briefing. 1. Nielsen claimed the children are not being used as “pawns,” despite arguing that Congress needs to pass legislation before the policy would be changed. DHS Secy: The children are not being used as pawns. We're trying to protect the children. Reporter: How is this not child abuse? Nielsen: We give them meals, an education, medical care, television. 3. Nielsen blamed previous administrations for the Trump administration’s decision to enforce the policy. "This entire crisis is not new," Homeland Security Sec. Nielsen said, pointing at "loopholes" in federal immigration laws from the past. Homeland Security Secretary Nielsen unapologetic re: policy of separating children from parents at border: "We have a duty to protect the American people... DHS will not look the other way." 6. Reporters noted that Nielsen made repeated false claims throughout the briefing, including saying that the separated children were able to contact their parents by phone. 7. She asked journalists to keep her colleagues at the Department of Homeland Security in mind in their reporting. 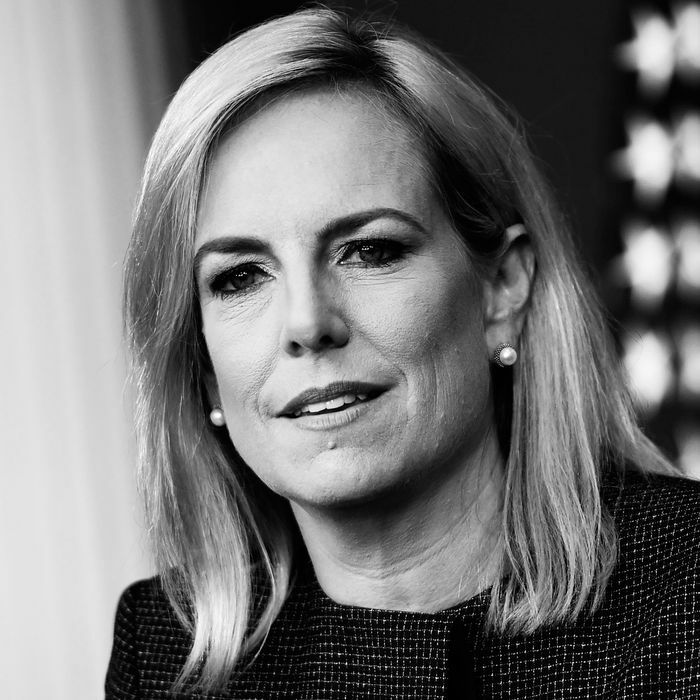 "Let's remember their sacrifice and commitment to this country," Nielsen says, asking reporters to write positively about her DHS workers. 8. Nielsen said she is “not familiar with” the images of children detainees that have been widely circulated. Reporter: Why is the government only releasing images of the boys being held? Where are the girls & toddlers? They have been flashing across television screens and printed on the front page of newspapers for days. For ways to help families separated at the border, please see here.